NOTE: This article was written before FT-8 and even MSK144, became popular. Many of the principals I mention are applicable to both, where I mention FSK441 then MSK114 can be substituted, and where JT6m/JTMS etc is mentioned then FT-8 can be applied. I plan to update this article with specifics on using FT-8 on the VHF bands when time allows. I’d like to share with you all my passion for working stations on VHF (6m, 4m and 2m) using Meteor Scatter (MS) as the propagation mode. I wrote this during the peak of the Perseid meteor shower in 2015 as it’s much more likely that a newcomer, even with a modest VHF station, inspired by the article to try and decode MS bursts, will decode bursts during the meteor shower peak, which in turn hopefully increasing the chances of them continuing to try MS after the peak has died down in the knowledge decoding is possible. Even though the shower I wrote this for is long gone, the article is still a good guide to get you started in MS.
By a modest VHF station I really do mean a simple station like an FT-817 or SDR as the receiver and a vertical collinear as the antenna. Of course a better radio and antennas like a beam would be better but it’s much easier to get started than many think, and that’s what I want to show. This has been proved during the writing of this article where a friend Stevie, 2M0ZFG in IO76, surrounded by 500m hills all around him (see his horizon plot below) and using an FT-817 radio + V2000 vertical collinear antenna (fed with RG-58) has been decoding MS pings on 2m (FSK441) from various EU stations and Steve, M0MVB, who has been decoding EA2ARD on 6m (JT6m) using his Kenwood TS-2000 radio and V2000 vertical co-linear antenna. Simply put, MS QSOs are made by reflecting (bouncing) your signal off the ionised trail of a meteor as it burns up when entering the atmosphere. Meteor trails are unpredictable and “random”, however there are times when the number of meteor trails increase, these are early morning, and during meteor showers, it’s during these times that your chances of making a QSO using MS as a propagation mode are at their highest. The increase in the meteor count during showers is obvious but the reason why early mornings also have an increase might not be so. It’s down to the fact that the point on the earth which has the sun rising, your location if it’s early morning, is facing forward in the direction of travel of the earth through space and so collides with more debris, but this also means that from noon till midnight the opposite is true, and it is the worst time of day for meteor reflections as your point on the planet has moved away from being at the front and is being somewhat shielded from space debris. Decoding MS pings needs a receiver capable of receiving USB along with a data interface or similar to decode the RX audio on a PC. There are now 2 software packages available to decode MS modes, which include JT6m, ISCAT & FSK441 (more on these below). The simplest of these I find to setup and use is MSHV by LZ2HV, the other is WSJT v10. 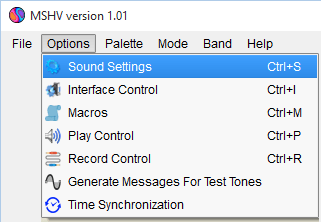 Download and install MSHV – it’s easy to configure & LZ2HV has a guide on his website if you struggle. Remember, if all you plan on doing is listening for meteor bursts then all you need to configure are the sound card settings and RX mode, you don’t need to change the callsign, macros or PTT settings. Due to the unpredictability of meteor trails a simple convention is used which maximises the chance of a station hearing you, this is any station beaming, or being located more West transmits 1st period. 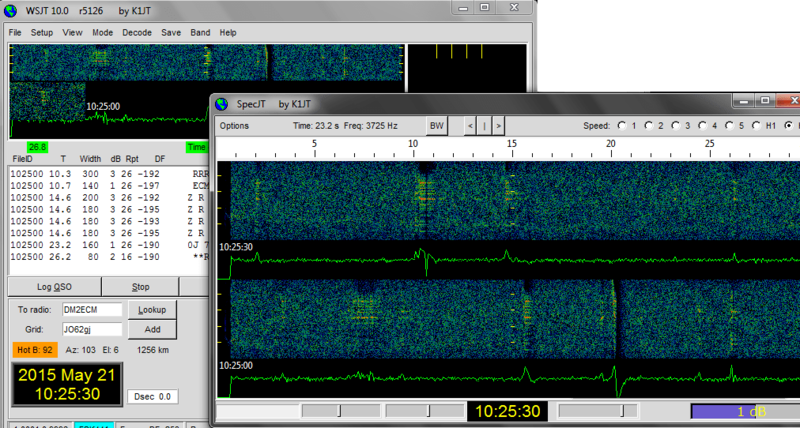 If beaming or being located more East, the station transmits 2nd period. The period can change in length dependent on the mode but the common MS modes of JT6m, ISCAT & FSK441 (SSB or HSCW (high speed CW) could be included here too) all have a TX/RX period of 30 seconds. The means the 1st period is 00-29 seconds and the 2nd period is 30-59 seconds, the result is the station who is more East transmits between 00 and 29 seconds and listens from 30 to 59 seconds, while the station most West does the opposite, this is mostly useful for random CQ’ing. When using an omni-directional use the period you like but if your intention is to work stations to the east of you remember that are likely TX’ing in the 1st period so are therefore listening in the 2nd. If you have a sked (a planned tune and place for a QSO) the relative position of the station to you (more East or West of you) should determine the period, you then set the period in the software and it takes care of the rest. When using the software in RX only (called Monitor) it will decode both periods allowing you to see all the activity. It will mean for 10 seconds in every period you’ll be TX’ing when you should be RX’ing and RX’ing when you should be TX’ing, ultimately reducing your chance of completing the QSO by 33%. There are a large number of propagation types which enhance, or attenuate, VHF signals. 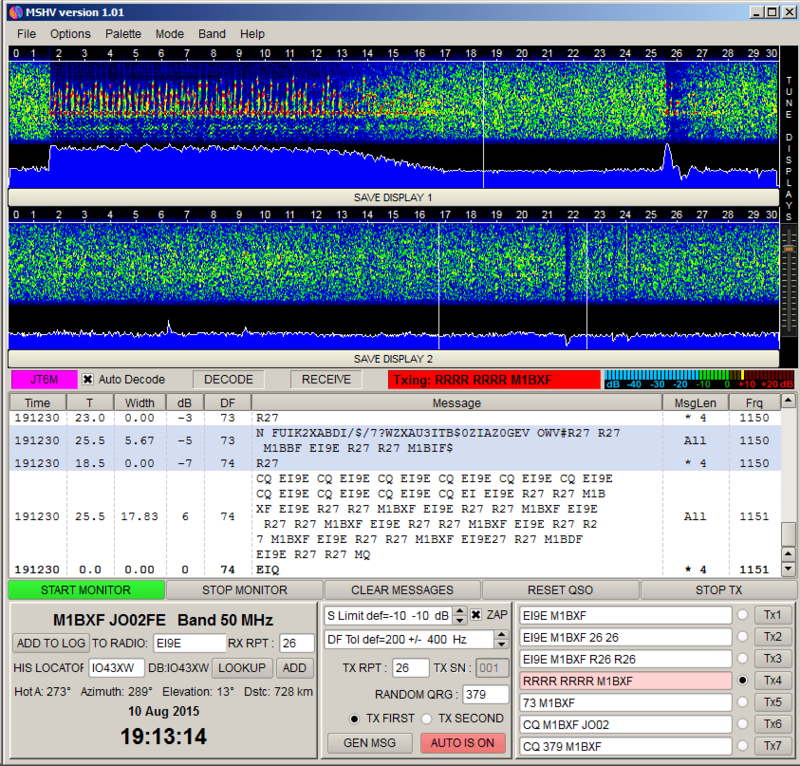 Tropo scatter and aircraft scatter are 2 of the main propagation types which have made using FT-8 on 2m very popular, these propagation types can allow modest stations to complete FT-8 QSOs on paths over 600Km. These paths have always been there, but since FT-8 became popular on 2m, it has highlighted how common these paths actually are. Because the output power is constant when using FT-8, and the frequency is “fixed” and “stable”, it’s much easier to notice when FT-8 signals increase in strength, sometimes increasing so much that signals appear from nowhere for a few minutes then fade into nothing again – this is where experience and patience is needed. If the QSO path is via aircraft scatter, and the aircraft is moving at a tangent to the QSO path, then it’c common to see doppler on the FT-8 signal. Here in east Suffolk, near the flight paths for Luton and Stansted airports, it’s common to see a single station being decoded on 2, 3 or even 4 different AF frequencies due to all the aircraft reflections and the Doppler caused by their motion. 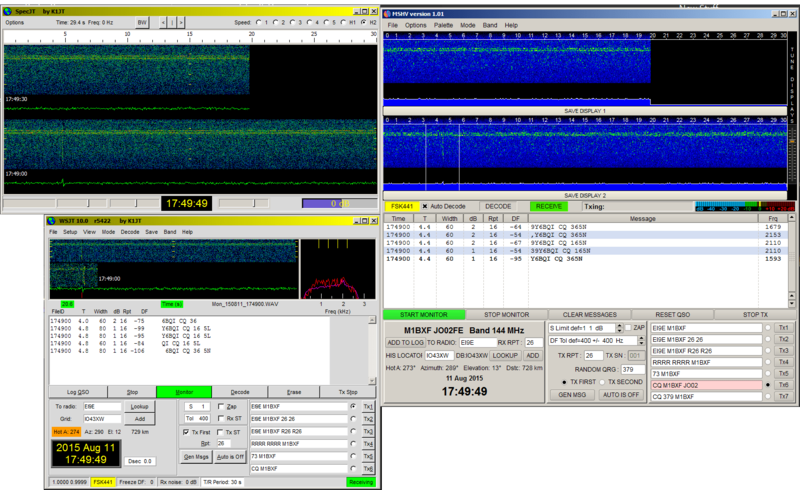 Each mode has a benefit over others, while SSB and HSCW are still used in Meteor Showers, like the Perseids, I’m going to stick with the MUM (Machine Celebrated Modes) JT6m, ISCAT & FSK441. 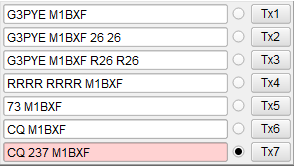 Here are the main calling frequencies (centres of activity) for 6m, 4m and 2m for these MFM modes. 4m is a little variable as different countries have different allocations so you may need to check the cluster or log into a VHF chat page like ON4KST (registration needed) to see what activity is about, or make a sked to know where to have the QSO. If very busy or paths to USA then sometime 50.323 is also used. 144.360 MSK144 This seems to be where stations CQ when using MSK144. 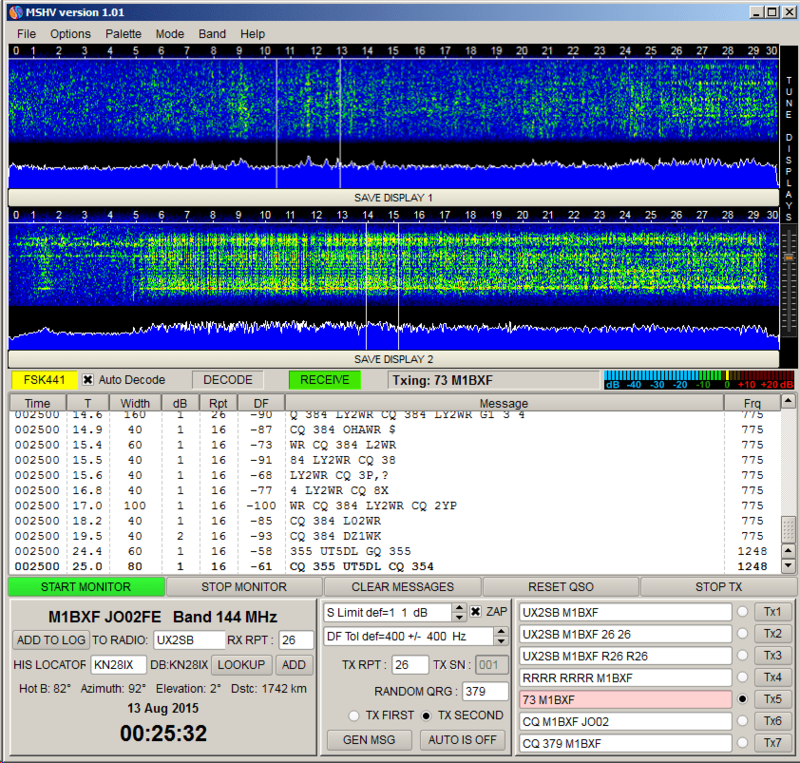 144.370 FSK441 FSK441 99% used for MS on 2m, SSB and HSCW are the others. Leaving your RX running on any of these modes with MSHV in RX (monitor only) mode, it’s highly likely you will see many reflections from a number of stations. With my Icom IC-910 + 9 element beam YU7EF EF0209 @14m AGL and Icom IC-756pro3 + 5 element Duoband @12 AGL I’ve worked 30 stations in the past few days, here is a map showing some of these QSOs, and remember this is otherwise a closed flat bands where people say it’s not worth operating on! After writing this article I thought I needed to run some more tests between MSHV and WSJT v10. With my IC-910 listening on 144.370 I started both WSJT and MSHV programs. The conclusion was MSHV has more accurate decodes, and in one instance meant I could have made a QSO when WSJT would not have allowed me to, I’m going to run many more comparisons as in truth although MSHV was better in these tests, there was in reality little difference between WSJT and MSHV was slight but this test was short. I also appreciate everyones millage (audio response out of their radio) may vary giving different results. You will most likely have to click on the images to open a larger version in a new window to read the decoded text clearly. In the first example the decodes are very similar, however the WSJT decode has an additional ‘1’ character on the message, what it does hint at is that in some instances such additional characters could lead to confusion, this might not be the best example to show my point due to the decent length of the decode, but assume the ping was half the length then the ‘1’ could cause confusion as to what the report could be; ‘26’ or ‘16’. In this second example, WSJT decodes much less of the ping than MSHV did. The first line is the Auto decode, the additional lines are my attempt to Manually decode the message by clicking on the burst. Note that WSJT fails to decode is the QSY frequency, either Auto or Manual, where as MSHV decodes ‘365’ using either. Both WSJT and MSHV report the burst length as being 60ms long, so the fact here is WSJT just decoded less than MSHV, ultimately meaning that if I were using WSJT alone I would not have know what frequency to call BQI back on (ok the full callsign was not decoded, 9Y6BQI is not valid). There is much more information on the web, much more than I want to include in this article. 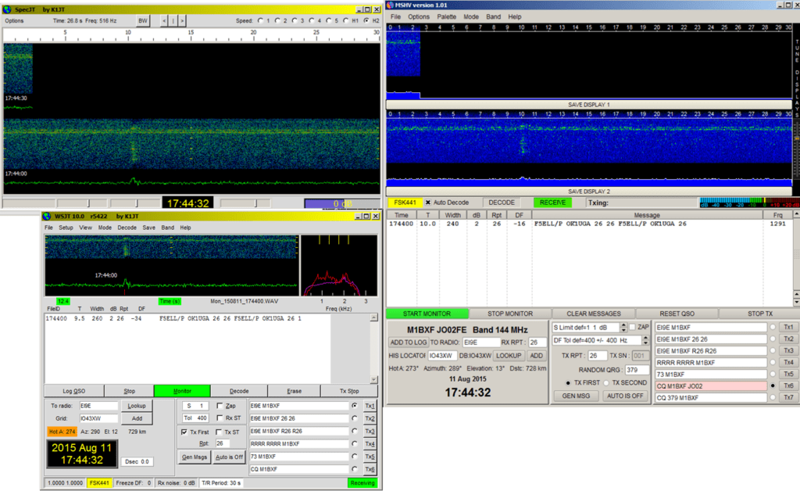 A few sources for additional information is John, G3WZT’s website and a video from a presentation given by Lyn GW8JLY I attended at the 2013 RSGB Convention on the topic “Meteor Scatter for Beginners”. I hope some of you give this a go, and please get in touch if you have questions. I note in the text that you are informing people to use JT6M on 50.230 Mhz. I would like to point out that this is within the CW & SSB General Usage part of the bandplan which should be free from MGM. MGM is now between 5.300-50.400 Mhz and has been such for 3 years. Perpetuating the wrong QRG means that it it is taking a long time for people to move, but move they should. You raise a fair point and I’ve updated the frequency table to provide better guidance about this. However as 50.230 is still very active for MGM modes, I don’t to exclude it from the list as lack of activity on 50.330MHz could put newcomers off with the belief their equipment is not good enough, but I understand you comments on this. I guess it’s a situation of what comes first, the activity or the QSY, much reminds me of a point in my DX segment rant! My goal here is to give someone new to MS the best possible chance of decoding someone else, in the hope it dispels the myth, in their mind at least, that VHF DX, especially MS, is too hard to make worth while. Thanks for the comment, and lets encourage people to move to 50.300-50.400MHz..